Does the name Shiva ring a bell ? I doubt it. Except that its a fairly common Indian name and its also the name of an important God for Hindus – the destroyer, Shiva. Does the name Sandeep ring a bell? Once again its a fairly common name in India and without a last name it is just another name. Does the name Sanjay ring a bell? Doubt it does, because without the last name there are millions of Sanjay’s. Let me give you the full names of these three people – N Shiva Kumar, Sandeep Singh and Sanjay Dutt. And please be honest to yourself … except for Sanjay Dutt, the other two could have been anybody. Some in the corporate circles would think I meant the Pepsico CEO Shiva Kumar but Sandeep Singh would have gone over everyone’s heads, except followers of our national game, hockey. In 2013, Sanjay Dutt went to jail for having the dreaded AK56 in his possession illegally, in 1993 during the terrible Mumbai riots. Whether he was a bumbling fool who was played or a rich idiot who was getting cheap thrills, he was a 34 year old adult at that time with a wife and a daughter. If he thought he was above the law, well, that’s arrogance not naivete. He was arrested in 1993 and then got out of jail courtesy his blessed father and then some sense prevailed and he was sent back to jail to complete his term in 2013. In 1993, N Shiva Kumar was 3 years old and Sandeep Singh was 7 years old. In 2013, Shiva Kumar was supporting himself by being a TOI vendor and newspaper boy in Bangalore and he cracked the CAT 2012 to get a place in IIM Kolkatta. Sandeep Singh on the other hand had survived an accidental shooting incident in a train in 2006, when he was almost paralysed for a year and overcame that to be the highest goal scorer for India in the qualifying tournament for the 2012 Olympics besides captaining the National hockey team. In the meantime, Sanjay Dutt continued to act in movies every year and earn crores of rupees till the court decided that he had to complete his jail sentence. The nation mourned and Bollywood was upset that their poster bad boy with a golden heart couldn’t act in movies for some time. Get my drift ? It was almost as if we were making a mistake by asking Sanjay Dutt to be in jail – while he was an innocent babe in the woods. It is deeply worrying that we as a people are so swayed by the pomp and show that we support the wrong people. Its no wonder that the CONgress party could CON us all this while – we are genuinely gullible. We melt when our stars “suffer” even if they are idiots, have loads of money and commit some serious crimes but a human being who survives against all odds and makes something of his life is not celebrated. I think I have found the clue to the urban Indian’s psyche :(. 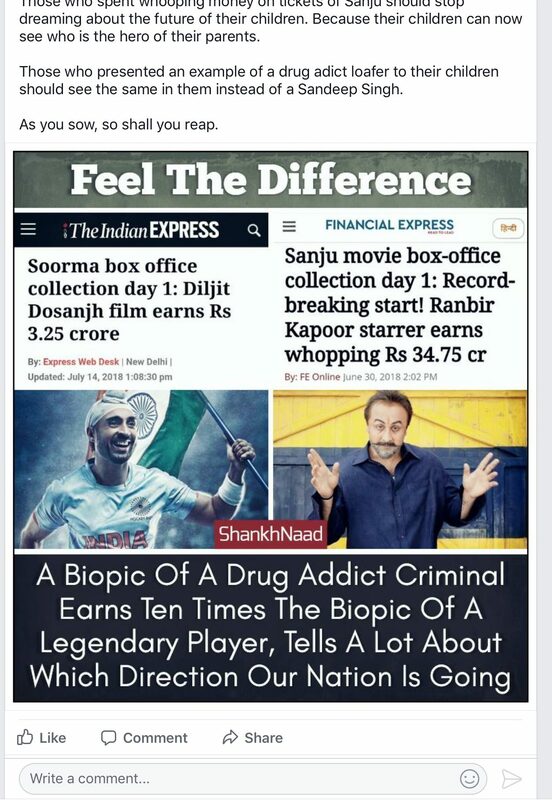 Also FYI – We haven’t watched “Sanju” and we will not watch it. Do read my blog from 2013 – He went to IIM, Sanjay went to Jail – So?. Misplaced priorities ? You bet.